Day 17, St. Mary’s Campground to Many Glacier Campground: 23.2 miles, 1,407 ft. elevation gain, 11.4 mph average speed. It stormed last night, the first big rainstorm of the trip and we were lucky enough to be in our tent. The storm was short, but the rain was torrential. We have a few holes in our rainfly and we didn’t bother with the ground tarp since it really didn’t look like it was going to rain as we were going to bed, so our tent last night was probably best described as very water resistant rather than waterproof. But it was really just a little damp at the corners, not a big deal at all. At least ourselves and all of our things inside the tent fared a lot better than our freshly-washed clothes that we left on our clothesline overnight. In any case, I woke up with more pressing priorities than damp clothes. Using Gina’s phone (thanks again, Gina!! ), I called Velocity to see if they could help me. The rep answered the phone, perhaps a little hung-over, perhaps just not fully awake. (I was calling at 9:01a EST, so I wouldn’t be surprised if he had just sat down at his desk.) I told him my sob story, and he asked me a series of questions about the wheel, how it was failing, when it was made, what tire I was using, and under what pressure. And that was that! Velocity is going to ship me a brand new wheel for free! He even agreed to ship it express. We’re having it shipped to the Many Glacier Hotel, and it should be there by Thursday. This is perhaps the best way this could have worked out. I get a replacement wheel for free and we get an excuse to do some hikes in the most beautiful part of Glacier National Park. Yay! Since we were riding less than 25 miles, we decided to take it slow in the morning. We put things that got caught in the rain (helmets, shoes, the tent) into the sun and took Dan and Gina up on their offer to share their oatmeal breakfast. We finally packed up and got on the road, only to stop after about five miles when we saw a cool, funky looking restaurant called Two Sisters Cafe in the middle of nowhere between St. Mary, MT and Babb, MT. 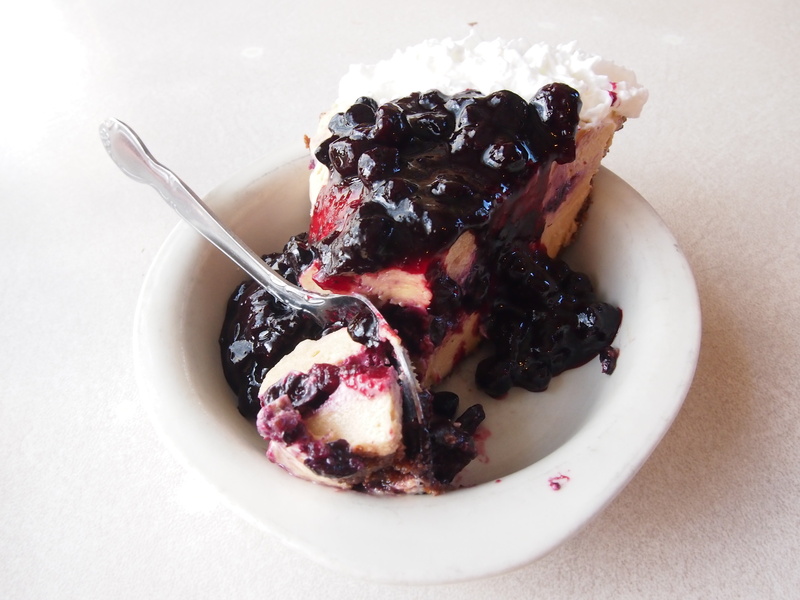 The server was a bike tourist, and regaled us with stories of his trips while we enjoyed a bison burger, an open-faced chili cheeseburger, mango-berry lemonade, and a piece of PB&J huckleberry pie (huckleberry pie meets peanut butter mousse!). After that incredibly satisfying meal, we continued on to Babb, MT where we stocked up on groceries for the next couple of days before riding the final 12 miles into the park. Holy headwind, Batman. It was rough! I’m not going to complain though. I want that exact wind blowing at our back for the next two weeks. 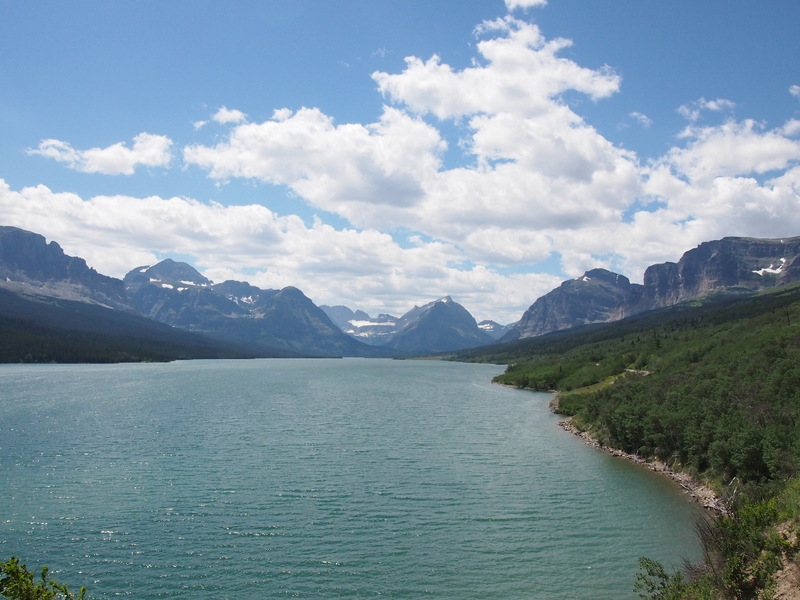 Many Glacier is beautiful. So so so beautiful. It has a rugged majesty, a feeling that this is what the world was like before humans got involved. Walking and riding around here, you just can’t help but feel awed and amazed. We fought our way through the wind and made our way to Many Glacier campground, which was full… but not for us! The National Park Service always sets a site aside for hikers and cyclists that enter the park without a vehicle, and we headed straight to that site and set up our tent. It was still pretty early in the day, so we went out to explore our surroundings. 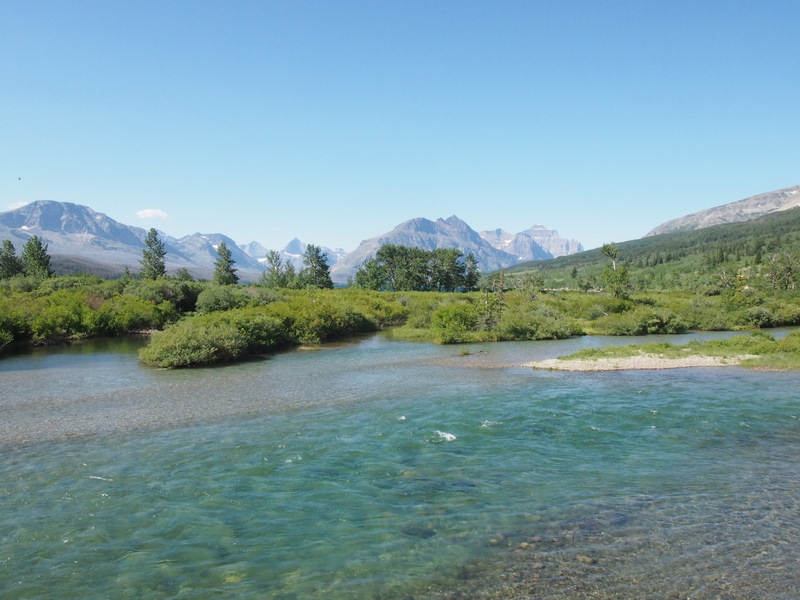 It turns out that the campground is a five-minute walk away from the Swiftcurrent Inn, which has a camp store fully stocked with cold drinks including chocolate milk, lemonade, and single beers. What more could we want? Public hot showers? Ok! A porch that looks out onto amazing scenery where we could sit and drink a beer? Sure! 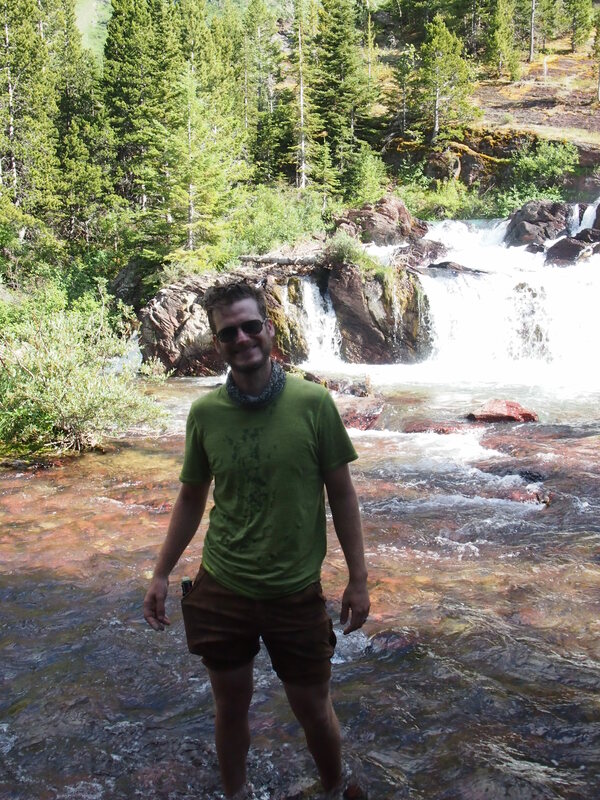 We decided to make the most of our time here, and so we found a short (3.6 miles round trip) hike to Red Rock Falls. I have a feeling that we’re going to spend the next few blog posts struggling to express the beauty around us, so maybe it will just be easier to say that if anybody is wondering where they should go on their next vacation, we suggest putting Many Glacier near the top of your list. After our hike, we came back to the inn, had a few beers on the porch, and reflected that if my wheel was going to break, this is the best possible place on our trip to be stuck for a few days. We’ll get to do a few more hikes than we thought, and we should be able to make up the day or two that we’ll lose. Dinner was pasta with a spicy red sauce with tuna, green pepper, and carrots, and we went to bed immediately after cleaning up. 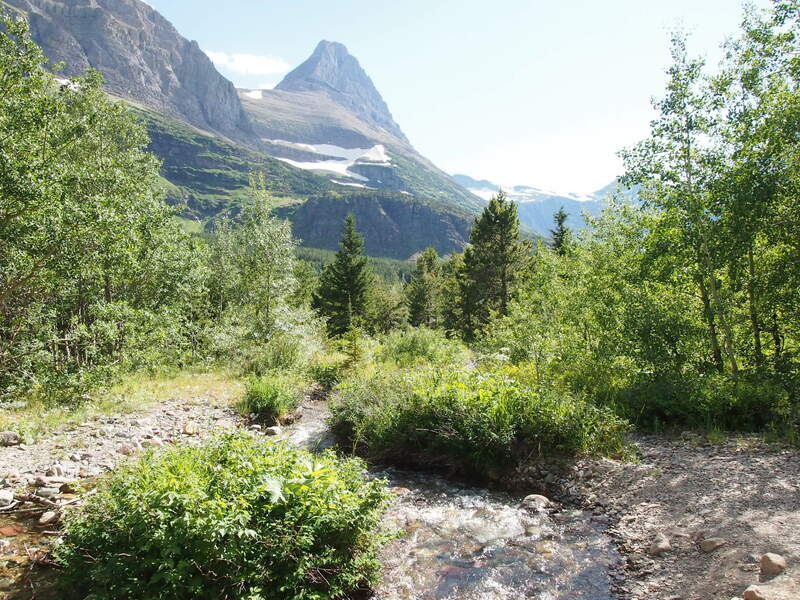 Tomorrow we’re going to hike to Grinell Glacier, which is supposed to be one of the most beautiful hikes in the park!